It's a smaller sale ad for Publix this week but there are some decent deals to grab. I need very little so I am going to pick up some produce, olive oil and some random items we need for a fun recipe I am making this week. The Buy Theirs, Get Ours Free promotion is back this week with the above pictured items. 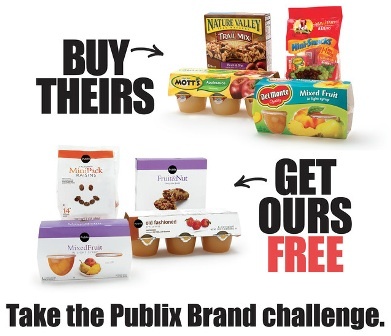 The way these promotions work is you buy the specific name brand item and you get the Publix version for free. My Publix's have started doing a display table/area with the specific products. You can use coupons on the brand name items to make the deals even better. Great information. I like your blog. Thanks for sharing.